As you may already be seeing lots of information flowing around in the internet around the GRID virtualization solution delivered by nVIDIA, there have been some quick and significant changes (improvements) over the last few years around the GRID virtualization offerings from nVIDIA GRID integration with VMware, Citrix and Microsoft for the Blast Extreme/PCoIP, HDX/3D Pro and RemoteFX protocol respectively, to deliver Graphics accelerated virtual apps and desktops. Per my opinion, out of the three leading vendors, VMware and Citrix have been aggressive in their commitment compared to Microsoft. However it may be aggressive with the introduction of Windows Server 2016 architecture and beyond. 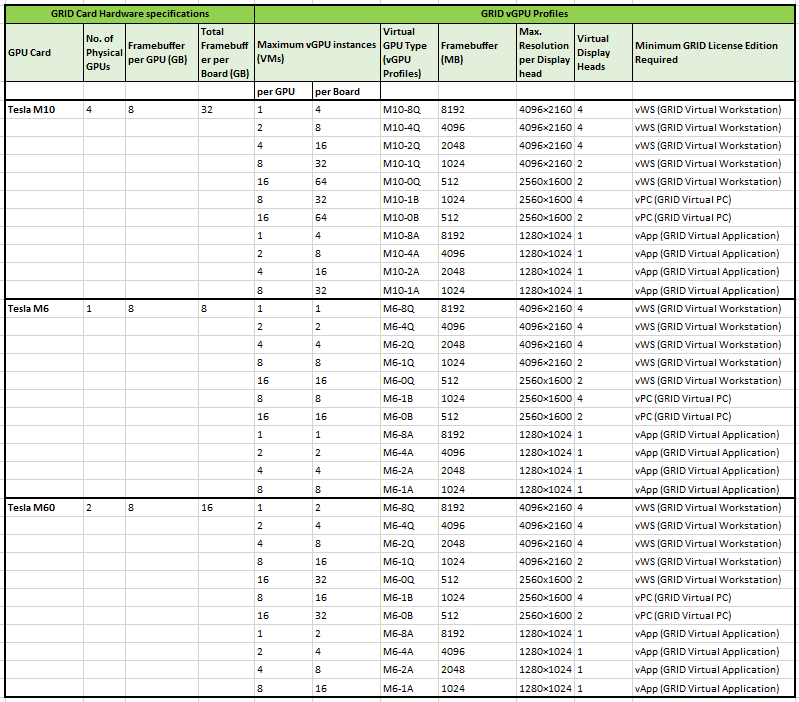 Having said that, I thought why not just put together a quick reference of the three primary GRID Card offerings from nVIDIA, their use-cases, vGPU profiles, licensing and other requirements. This may come handy for the Sales and the Pre-Sales team to basically engage with their customer base to identify the needs of User Experience at its highest quality apart from the graphics intensive apps & desktop virtualization. Important Note (Disclaimer): Please be aware while reading this that many of the features, functionalities may not have been tested, validated and thus may change from real-time results. Therefore, I strongly recommend you to leverage (as applicable) the official documentation, whitepaper and blogs from nVIDIA, Citrix, VMware and Microsoft or other reliable sources, as there are continuous changes and updates are being released constantly. Few of the important official documentation are listed in the references section at the bottom of this blog. *Support, Updates, and Maintenance Subscriptions (SUMS) ensures that you have 24×7 access to technical support, along with timely software patches, updates, and upgrades. SUMS is included in your NVIDIA GRID software subscription, but is a required one-year add-on if you choose a perpetual license. NVIDIA GRID K1 and K2 GPUs do not require a license to run vGPU. *GPU pass-through requires special hypervisor enablement which is available in VMware vSphere Hypervisor (ESXi) and Citrix XenServer. *Windows Server 2016 supports NVIDIA GPU pass-through with Discrete Device Assignment (DDA). NVIDIA GRID vGPU (shared GPU hardware acceleration) Available with vSphere 6.0 and later, this feature allows a physical GPU on an ESXi host to be shared among virtual machines. This feature offers flexible hardware-accelerated 3D profiles ranging from lightweight 3D task workers to high-end workstation graphics power users. Virtual Dedicated Graphics Acceleration (vDGA) Available with vSphere 5.5 and later, this feature dedicates a single physical GPU on an ESXi host to a single virtual machine. Use this feature if you require high-end, hardware-accelerated workstation graphics. Virtual Shared Graphics Acceleration (vSGA) Available with vSphere 5.1 and later, this feature allows multiple virtual machines to share the physical GPUs on ESXi hosts. This feature is suitable for mid-range 3D design, modeling, and multimedia applications. Soft 3D Software-accelerated graphics, available with vSphere 5.0 and later, allows you to run DirectX 9 and OpenGL 2.1 applications without requiring a physical GPU. Use this feature for less demanding 3D applications such as Windows Aero themes, Microsoft Office 2010, and Google Earth. VMware VMotion Capability: Because NVIDIA GRID vGPU and vDGA use PCI pass-through on the ESXi host, live VMotion is not supported. vSGA and Soft 3D support live VMotion. Note: Based on my search online, there are not proper official documentation by Microsoft on RemoteFX, GRID or otherwise. And the blogs are quite old and relies mostly on results gathered from various customer environment and user community. Support for NVIDIA Kepler architecture. HDX 3D Pro supports NVIDIA GRID cards (see NVIDIA GRID) for GPU pass-through and GPU sharing. NVIDIA GRID vGPU enables multiple VMs to have simultaneous, direct access to a single physical GPU, using the same NVIDIA graphics drivers that are deployed on non-virtualized operating systems. Support for VMware vSphere and VMware ESX using Virtual Direct Graphics Acceleration (vDGA) – You can use HDX 3D Pro with vDGA for both RDS and VDI workloads. This entry was posted in Enterprise Virtualization and tagged GRID, NVIDIA, vdga, vgpu, vsga. Bookmark the permalink. A Great post! It would be nice if we could download matrixs above in Excel format. Thanks Akihiro! Understand will reformat the blog to enable copying.